Saturday afternoon I bought four slices of Benton’s bacon from Zingermans Deli (it’s a dry cured bacon, and very intensely flavored), and headed home. 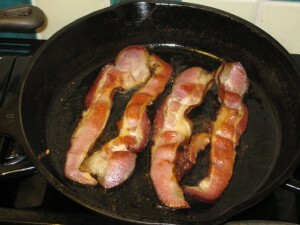 The bacon slices are very impressive – thick and meaty, a good ten inches long, and almost 2 inches wide. I pulled out my largest skillet, and they barely fit! First I fried the bacon until fairly crisp, but I did not make the mistake I made with Benton’s before of cooking it too long (it cooks faster than your conventional bacon, which has a lot of water in it), and so took it out of the skillet while it still had some bend to it – it seems to crisp up a little more even after it’s out of the pan. The bacon shrunk a bit while cooking, but not very much! And it left a nice amount of fat behind. I chopped the bacon coarsely and set it aside. 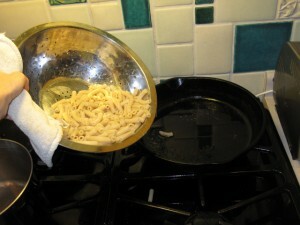 Meanwhile I’d been cooking the gluten-free rice penne pasta in a large pot of salted water. (We’ve found Tinkyada brand rice pasta to hold up the best.) I drained it while it was still a bit hard – I have to keep tasting pasta almost every minute after the first 5 minutes of cooking. I’m classic for overcooking any pasta, and especially for rice pasta it’s essential not to overcook it since it disintegrates under any kind of pressure after that. The bag’s cooking directions are ridiculous – it says cook for 15-17 minutes, and I find it’s usually done in 10. Anyway, I managed not to overcook the pasta, drained it, and then put it right in the skillet with all the bacon fat, and added in the chopped bacon too. 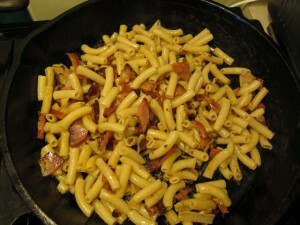 It sizzled and I found it was necessary to keep stirring it pretty vigorously – the pasta was absorbing all the bacon fat at an amazing rate, and, wanting to stick to the bottom of the well-seasoned iron skillet at the same time. I stirred it over medium heat for a couple minutes, and then ground some pepper over the top, a bit more salt, and served it into bowls. 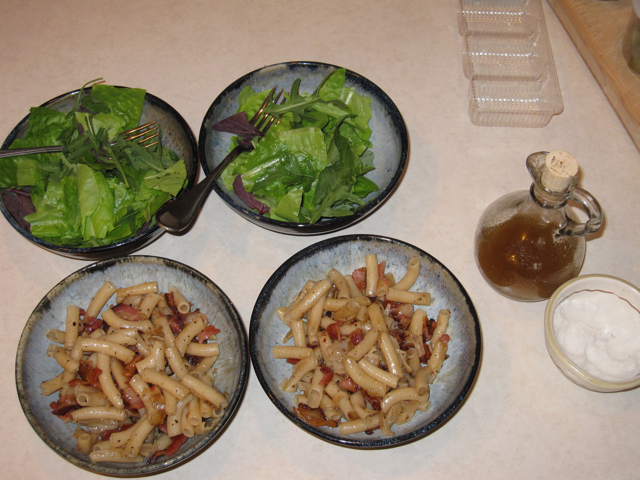 We had some fresh greens on the side, and ate every morsel! I liked the flavor a lot – an extremely simple dish but the smoky, salty flavor of the Benton’s really made it rich and satisfying. We thought maybe next time we’d toss in a bit of this or that for variety – maybe a few grape tomatoes, sliced in half – but it’s also quite good just on it’s own. As Ari mentions in the book, this really good dish gives a new meaning to “fast food”. I was having people over on Sunday, and since they all eat bacon the time was ripe to try another recipe from Zingerman’s Guide to Better Bacon – called South Carolina Red Rice. It came out well and was quite tasty. It only had a few ingredients, and, because it’s so simple, I think it’s key that all ingredients are very high-quality – good chicken broth, good tomatoes, artisanal bacon, and the Carolina Gold rice. I was skeptical that the rice-to-broth ratio was going to work at only 1 to 1, AND, that it would be done cooking after only 10 minutes with the burner on and 10 minutes sitting with the burner off! But I stuck to the recipe, and it worked just fine. The raw rice was sauteed for a while over medium-high heat in bacon fat, with the carmelized onions, so I think that that reduced the time it needed to cook in the broth, and since the rice is a special kind (the grains are shorter than your average rice), maybe that reduces the amount of liquid needed. Just a guess. I used the Arkansas Peppered Bacon, which I had never cooked with before. It had a very generous amount of pepper on it, which flavored the dish pretty strongly, but fortunately I like pepper! 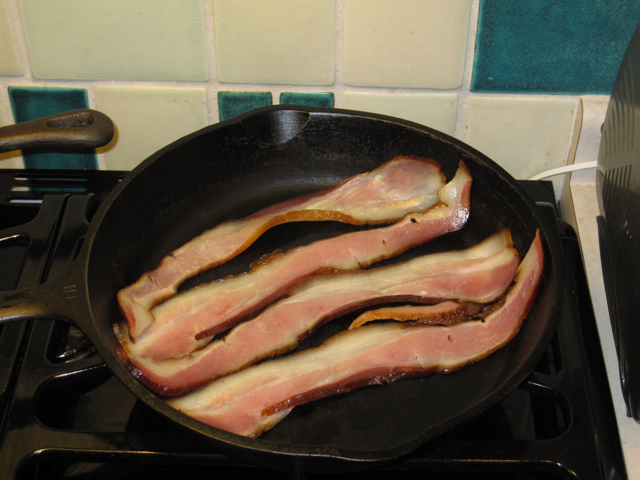 And the bacon strips kept their size well even when fully cooked – it’s great how these bacons are mostly meat, rather than having a lot of water, as is the case for supermarket bacons. They also gave off a nice amount of bacaon fat, for cooking the onions and raw rice in – I did not need to add any more bacon fat. The recipe said to “season to taste with salt and pepper” at the end, but for most folks it would have plenty of pepper already. If you were not using peppered bacon though, you would want to add pepper. 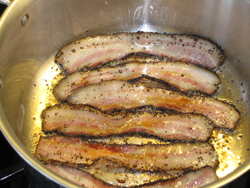 If you don’t like much pepper, you could fish out more the pepper from the bacon fat than I did, after you cook the bacon and remove it from the pan. I served it with cole slaw on the side (which my cousin had made, a crunchy counterpoint), made a lovely dinner. I did 1.5 times the recipe, for five adults, but probably only needed to do 1 times the recipe – we had several cups worth left over. But happily, it makes a great meal the next day too. 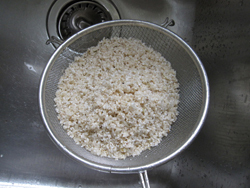 Wash the rice in cold water three times, or until the water runs clear. This keeps the grains from sticking together. Halve the tomatoes and squeeze the juice into a medium bowl. If you’re using canned tomatoes, use the juice from the can. 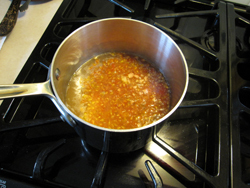 You’ll want about 2 cups of liquid for cooking the rice, so top off the tomato juice with chicken broth if necessary. Chop the tomatoes and set aside. You should have about 1 cup. Reduce heat slightly and add the chopped onion. Saute, stirring occasionally, until nicely caramelized – about 20 minutes. When the onions are just about ready, bring the broth and tomato juice to a boil in a medium-sized pan and reduce to a low simmer. If you’re working with unsalted broth, add 1 teaspoon coarse salt. 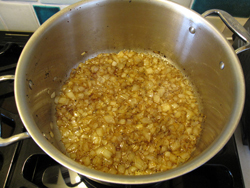 When the onions are caramelized, raise the heat in the pot a bit, add the rice and stir well. Saute for a couple of minutes, stirring constantly, until the rice is very hot and shiny. 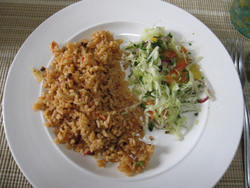 Stir the chopped tomatoes into the rice and cook for several minutes, stirring constantly. 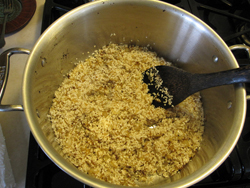 Add the simmering broth into the rice, stirring well. Bring to a boil, cover the pan, reduce heat to low and cook for 10 minutes. Turn off the heat. (And don’t pick up that lid to look, either, OK?) Let stand, covered, for another 10 minutes. While the rice is cooking, chop the bacon. Remove the lid from the rice pot, add the bacon and stir gently. Flavor with salt and a generous dose of freshly ground black pepper, fluff with a fork and serve. Zingerman’s Guide to Better Bacon will be on sale at all Zingerman’s businesses starting July 1, 2009! The author and Zingerman’s co-founder Ari Weinzweig will be at Zingerman’s Deli to sign books from 11am to 1pm. And, come back that evening at 7pm, for a bacon tasting! $30 in advance, $35 at the door. See the Deli Events page for more details. One step was accidentally left out of the Cheddar Bacon Scones recipe – on page 212 – please make a note that the cooked, cooled bacon is to be folded in to the dough with the scallions. Thanks!